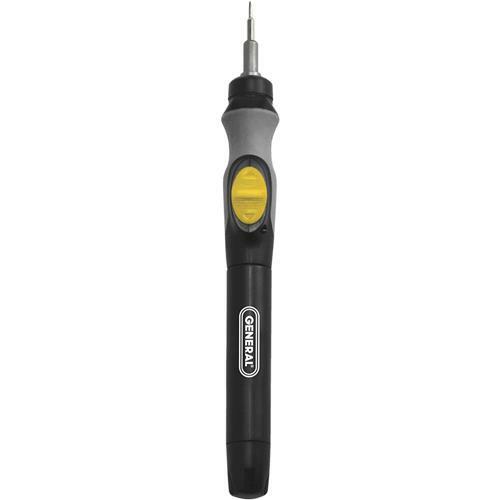 This groundbreaking precision screwdriver is the perfect tool for on-the-go technicians, hobbyists and anyone who works with computers, electronics, small parts and micro assemblies. The pen-size Model 500 is superbly functional in design and comes complete with six interchangeable driver tips. It features the exclusive 100+ RPM Super Micro-Torque drive motor, forward and reverse controls, and a 1/8" chuck that allows for effortless swapping between Slotted, Phillips and Torx bits. An ergonomic handle design provides multiple grip positions to accommodate a variety of working situations. This tool comes in very handy for me. I do some work on clocks and small and delicate is what clock work is all about so this tool is strong enough to get the job done without stopping delicate dress and nuts.